Last week, I turned my desk around. It seemed like such a small move in the grand scheme of things. Instead of facing out into the room, I turned it so it faced the wall—blank, uninspiring, and free of distractions. Most importantly, I was out of reach of the TV. By turning the desk around, I made it easier to sit down and start writing. Before, I had to go around the back of the desk to sit in my chair. I had to maneuver my way into the corner. Once seated, it was almost impossible for me to get out. Whenever I wanted to write, thinking about the difficulty of just getting in and out of the chair could be enough to keep me from writing. I got sick of not writing. It was time for a change. I turned the desk around. In doing so, I made it easier to write, which led to more writing. It’s as simple as that, ladies and gents. In life, we underestimate the power of small changes. It’s amazing how a haircut, new outfit, or altered recipe can shift our mood or way of thinking. Temperature and light affect our productivity levels, sleeping habits, and social interactions, all without our noticing. 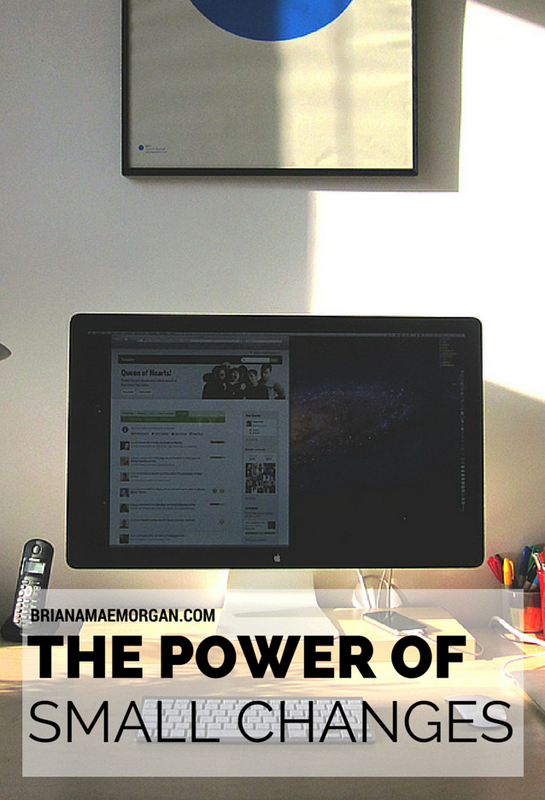 Imagine how much you can alter your writing productivity by making some simple tweaks. If you’re not happy with your writing performance, a couple of small changes might be in order. Crank the air conditioning, pour yourself some wine, turn the desk around. You never know what change of pace might light a fire in you. What simple changes have had the most profound impact on your life? Love this post, Briana! It’s incredible what small changes can do, isn’t it?